The advent of River Song to Big Finish’s ever-expanding lineup has allowed for a continuing and immense exploration into this fascinating character who has been so intimately involved with the Doctor’s many incarnations, including several much earlier than her on-screen introduction would suggest. Naturally, such close association with this renowned Time Lord both through love and reported murder makes her a person of interest for several entities throughout the universe, and the fifth series of The Diary of River Song finds her confronting no fewer than four incarnations of arguably the Doctor’s greatest nemesis, the Master. ‘The Bekdel Test’ by Jonathan Morris opens the set with River in the unfamiliar situation of having no idea where she is or who has brought her here. This is at a time when she is still a prisoner of the Stormcage Containment Facility, but it seems to be an open secret that she spends vast periods of time outside of confinement, to the point that River brazenly flaunts the fact that her eventual voluntary return is the reason for celebrations. At this new facility, the Director smugly proclaims that she is here as a means of publicity and that he encourages her inevitable escape attempts to prove just how staunch his means of detention are, perfectly playing into the pride of River while ensuring that his desires fuel her own and in quick succession proving that his claims just may be justified when even physical force and apparent murder yield no results due to his forward thinking and technological backstops in place. Of course, this is much more than a simple one-on-one battle, and as a motley assortment of dangerous warlords and unique killers are introduced within this prison River discovers that a Time Lord wanted for any number of crimes is due for imminent arrival. For once, this is not the Doctor staging an elaborate and audacious rescue attempt, and there’s great fun with River coyly playing with just who this woman before her might be. Making her Big Finish debut as Missy prior to her self-titled series due out soon, Michell Gomez transfers her character’s roguish charm and haughtiness to the audio medium perfectly, and she forms an instant chemistry with Alex Kingston as the two quickly form an uneasy alliance and build upon their respective relationships with the Doctor and mutual desire to escape. Though neither would dare admit it, both of these characters are quite similar in many aspects despite some rather obvious differences in how directly they confront a problem, and they begrudgingly accept that they must work together while exposing the con and hidden purpose at the heart of them being purposefully brought to the same location. This is a nearly flawless entry in River Song’s growing library of adventures, and it’s a testament to both actresses and all involved in the production that an ongoing series with these two seems so eminently possible following this brief tease that hits all of the right notes. ‘Animal Instinct’ by Roy Gill sees River cross paths with Geoffrey Beevers’s scarred Master as she tries to teach a student the finer points of archaeology. Somewhat surprisingly, this chosen field is relatively rarely shown with River, but the visual of the Master awakening from stasis as she opens a long-sealed door is a fantastic beginning that sets in motion an unwitting alliance as River searches for treasure and the Master his TARDIS on a nearby moon that is so dangerously secluded from exploration and exploitation. In fact, this world being in the midst of a carnival in which the very essence of life appears to be celebrated is a fitting contrast to this version of the Master in particular, but the bestial costumes of those participating unknowingly hint at a far darker secret at the heart of this civilisation that has long since been forgotten. It’s strangely rewarding to see a long-gestating trap for the Doctor go so wrong, but the continued revelations surrounding the creatures on the moon and their sun god who they know must be killed to regain their freedom is immense. With danger lurking at every turn as the small assembled team fights to stay one step ahead of their pursuers and certain death, it’s again clear just how similar River’s actions can at times be to the Master’s, though naturally this foe is willing to take much more drastic measures when necessary to serve the greater good as he would have others believe. In fact, given that this is the second consecutive story in which River must ally with the Master, it’s intriguing to note just how different her relationship with Beevers’s version is since she seems more respectful and wary of the danger she knows he poses. She’s still flippant to some extent as she mocks his appearance and classic old-school villainous stylings, but she’s also more cautious even while proving to be one step ahead as she is subjected to his mesmeric influence, and that understated tension beneath the confidence and charisma of both is spectacular and further heightens the immense atmosphere of this environment and the plight of the people that the Master has so totally manipulated. Eddie Robson is tasked with bringing arguably the most ill-defined version of the Master back to life in ‘The Lifeboat and the Deathboat,’ Eric Roberts’s incarnation who featured only in the Eighth Doctor’s televised debut before seemingly meeting his death in the Eye of Harmony. Of course, the Master is never one to give into expectations regarding his presumed demise, and Roberts steps back into the role easily with an understated menace and power while showing just how profoundly manipulative and ruthless this version who is searching so desperately for an escape can be. Whereas the previous two stories essentially portrayed River as knowing who she was dealing with straight away, here she seems genuinely clueless that the trapped evolutionary biologist is simply another disguise; accordingly, the kind and dedicated demeanour Roberts depicts as the stranded Daniel while he tries to salvage technology from other wrecked ships to create a means of escape for not only himself but his beloved daughter and the likewise-stranded River help to create a very personal investment for River that perhaps makes her somewhat less guarded than usual and therefore willing to help in any capacity she can. Overcoming a bit of clunky exposition to introduce Admiral Eno and Valencia who are hunting down the same vengeful monster that roams the vortex around the wreckage in which the Master is trapped, the dovetailing of these stories works quite nicely and makes the most of some staggeringly immense visuals and the very intriguing notion of a ship being split temporally but not spatially. While it is true that the story rather overplays its hand regarding the inevitable secret that the woman who insists she is the Master’s daughter must hold by hinting too much at what is driving Eno and the stories she has been told, the eventual reveal is nonetheless effective and ties in a fragment of the Doctor’s past seamlessly while simultaneously explaining the Master’s continued existence and affording River a grand chance to stand up to the evil before her and help yet another being in need. This is a well-paced and action-filled story that makes the most of its confined environment, and Roberts and Kingston play off of each other incredibly well both when identities are shrouded and known with an incredible range of emotion on display. While it remains unknown to this point whether this incarnation of the Master will feature again or not, the extremes he is willing to go to hint at a potentially much more malicious incarnation who still retains his other selves’ intelligence and ability to deceive and charm as needed, and this small sample certainly proves that he has much more to offer if given the chance. 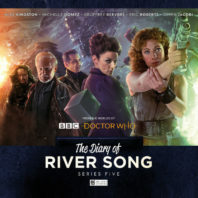 Scott Handcock closes out this fifth series with ‘Concealed Weapon’ as River finds herself fighting to protect her colleagues as the crewmembers of her deep space exploration mission begin dying without logical explanation. This approach allows the supporting cast to quickly develop as they try to come to terms with the sudden uncertainty surrounding them, and the suspicions being cast give further definition to each as fears and biases come to the forefront. With a ship’s computer that seems strangely unable to answer any pertinent questions put to it but that insists on a life sign count one higher than it should be, an uneasy and tense atmosphere is created well before the inevitable introduction of the Master that ensures this story is much more than just a novelty interaction between Alex Kingston and Derek Jacobi’s most dangerous Time War incarnation. Of course the inclusion of the Time War mythology and just what depths both the Time Lords and the Daleks have sunk to is always a fascinating portion of Derek Jacobi’s tales, whether those components feature overtly or more subtly in the background. This is an incarnation that- like Beevers’s- exudes a certain silky suaveness that accentuates the threat he represents, although here obviously with less of a menacing physical appearance, and Jacobi continues to excel as this master manipulator who is so forward-thinking that he can even plan for the possibility of failure in his schemes. Here, he speaks of how the warring races have begun experimenting with combining different species and the time vortex itself, and he’s keen to be on the pioneering edge of this research with the genetic material of a long-dead species he has acquired. No version of the Master is afraid of using others to achieve his or her goals, but his exploitation of base instincts and desires of individuals here who so willingly put aside their mutual bond for what he offers is devastatingly effective. Fittingly, River proves just as capable of outmaneuvering others as she exploits a flaw in the Master’s plan, but even then a promise he made to explore her past provides a staggering conclusion that once more perfectly epitomizes this incarnation of the foe perfectly. River Song is an incredibly engaging character, and Alex Kingston has absolutely made the character her own with a captivating charm and charisma that highlights the character’s unique combination of good intentions and sometimes more direct and assertive tendencies. However, while listening to her interact with her husband’s former selves has been an absolute delight, pitting her against four incarnations of the Master allows for a much more thorough exploration of the character as she must confront and- when the series is at its best- at times willingly ally with this person she knows to be so incredibly and deadly dangerous. Indeed, the ease with which she can do so serves as a reminder of her conditioned past and just how nuanced she has become since meeting the Doctor, and using her as the foundation in these four very unique circumstances has helped to provide perhaps the greatest singular exploration of just how similar yet distinct the many versions of the Master truly are. With four incredible performances from actors who have starred in the villainous role over the past four-plus decades, the fifth series of The Diary of River Song is a perfect love letter to the Master as a character and to the Doctor Who and its evolution as a whole.